Excuse me while I go FacePalm, really hard. The difference between translators in Lebanon and translators abroad, is that the latter have the utmost respect and value for their profession. They lift each other up, stand by each other, and fight for each others’ rights. The case here in Lebanon couldn’t be more different. Well, today’s post will only be joining the previous ones. One of our brilliant (not!) 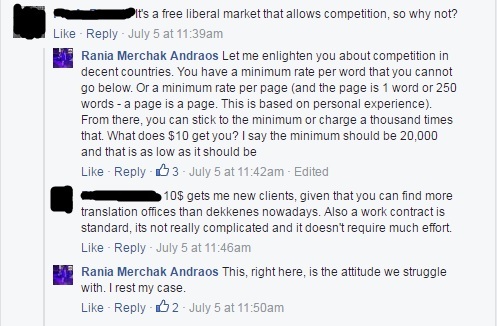 fellow translators thought it was Okay to charge a low rate. This way, she would be “getting more clients”, and “not stealing people’s money”. Ironically, she got offended when I told her that poor rates channel poor translations. So if I translated a certain document before, I might as well not charge for a new similar one since I already have a sample? If this is logical, then why does a doctor charge for the same prescription over and over again? Do you EVER hear a doctor say “Oh I wrote this prescription before, I will lower my rate for the future similar ones”? Like, what the hell? By the way, a contract is not basic. Basic is what is standard, such as an ID card or a driver’s license! When will Clients stop Thinking we would Actually work for Peanuts?